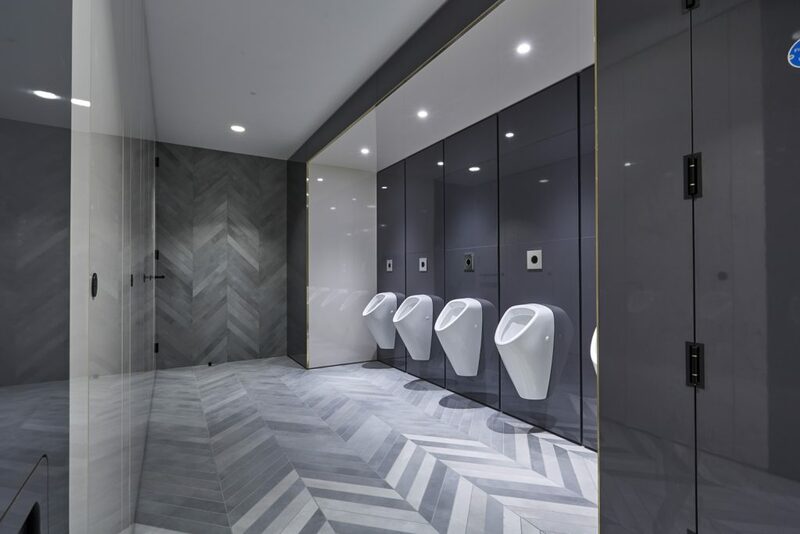 Maxwood has once again demonstrated its design and manufacturing expertise with executive washrooms for a landmark commercial development in Central London. Maxwood’s package for Three Pancras Square, the latest building in Argent’s King’s Cross masterplan, provides male, female and accessible washrooms over ten floors of contemporary office space, together with changing facilities in the basement. 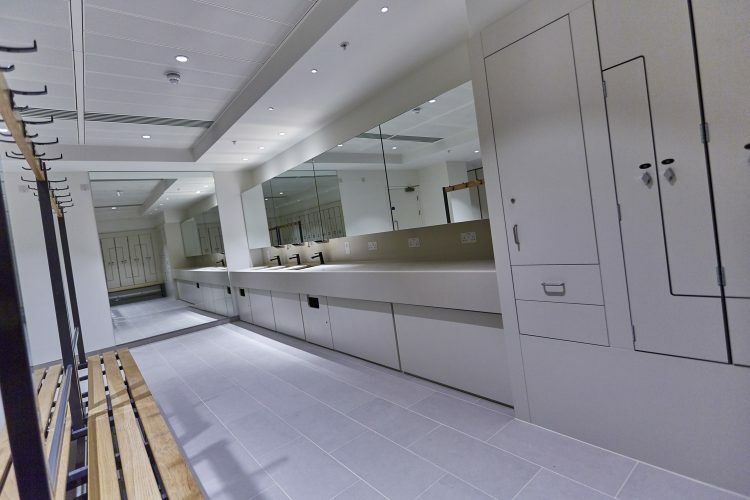 The full-height doors to the Marante toilet cubicles at Three Pancras Square are faced with a cream-coloured gloss laminate with black PVD hardware and are fitted with fall-to-close hinges. The cubicles’ attractive flush surface appearance is achieved with a unique pilaster design, rebated to run in-line with the doors. Vanity tops for the new washrooms were manufactured from Krion in a neutral shade, creating a dramatic contrast to the gold and black elements. Maxwood’s innovative Prism Mirror Box units complement the vanity area, combining sleek styling with convenient storage. Lift off mirror panels enable effortless access to washroom supplies such as paper towels and soap dispensers. In addition to designing executive washrooms for the new building’s upper storeys, Maxwood provided smart, practical solutions for male and female changing rooms located in the basement. These include extra tall toilet cubicles, for added privacy, from its water-resistant Marin XT range and Oracle lockers. With its space-saving design and robust construction, Maxwood’s Oracle locker system is ideal for this type of tough environment, providing secure personal storage that is easy to maintain. The facilities are completed with Opex bench seating with solid ash slats and handy pull-out ironing boards. 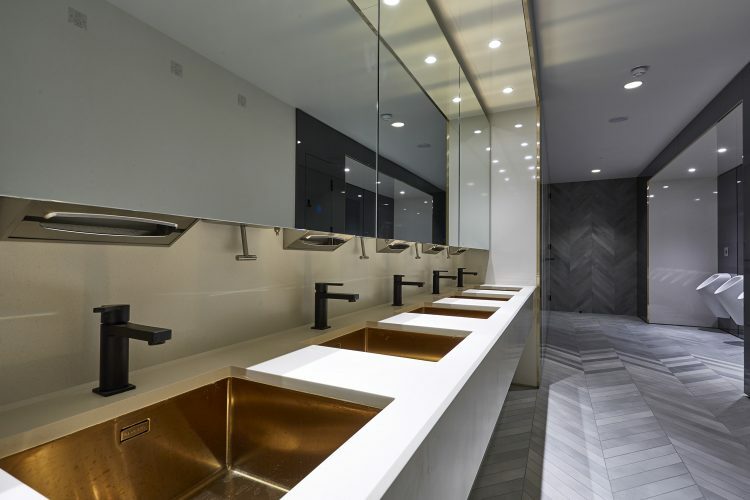 Pipework and mounting of sanitaryware for all washrooms at Three Pancras Square was concealed by the use of Maxwood’s Maxwall Duct Panelling system. Made-to-measure ducting units in grey gloss were manufactured offsite by Maxwood and delivered to site ready to install to toilet/shower cubicles and male urinals.